Are you tempted to try the DIY approach when dealing with an unexpected garage door problem? Sure, we understand. A hands-on attitude can save a few dollars here and there, but when it comes to the big jobs, like dealing with a complex overhead door system, you're better off calling us. Our skilled and experienced technicians are equipped and trained to handle every kind of repair job, and we'll do it at a price you can afford. Our teams of professional technicians are skilled at fixing every type of door, regardless of its make and model; sectional or single panel, overhead or up and over. We have the necessary experience and knowledge to take care of any possible issue, and to find the best possible solution that will actually last and won't be just a temporary fix. We work with major brands like Clopay, Windsor and Raynor, so you can count on the fact that any replacement part we install will be of the highest possible quality. Some of the most common issues are spring related. These crucial components are in charge of supporting the door's weight and helping it move, so its' only natural for them to go through a lot of wear and tear the more you use your system. The rollers are another possible cause for concern, as they too are constantly experiencing friction, moving along the tracks (which can also develop some flaws). Our team specializes in performing spring replacement, as well as track alignment and more, so if your door slams shut suddenly, or has trouble moving for whatever reason, you can count on us for help. Remember, unless you have all the required skills and experience to safely replace something like a frayed cable or a damaged panel, you shouldn't attempt this type of task on your own. 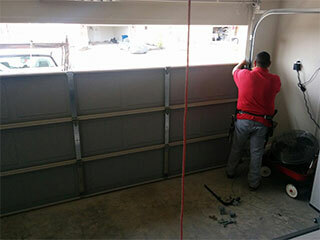 Our experts at Garage Door Repair Oceanside can take care of all the dangerous issues and make sure that your system returns to its normal performance. Contact us as soon as you find yourself in need of assistance.